Park Shin Hye and Jung Yonghwa officially declare their sweet relationship status as lovers. Episode 10 of MBC drama 'Heartstrings' will feature the publicized relationship of Lee Gyu Won (starring Park Shin Hye) and Lee Shin (starring Jung Yonghwa). The sweet Dooley Couple will go on secret dates, hold hands and.. kiss for the first time. Drama officials say "Park Shin Hye and Jung Yonghwa are like life-size comic characters. Their charms are so fresh and innocent. The first kiss scene between them will unfold in Episode 10." In the video preview of episode 10, audience can catch a glimpse of the cute romance of the new campus couple. Park Shin Hye will also transform into a Guitar Girl in the upcoming episode of Heartstrings to 'escape from the terror of Lee Shin's fangirls' and... Well you will have to watch the drama and find out! are they actually dating in real life??? the killer smile of Yonghwa!!!! OMG CANT HARDLY WAIT!! 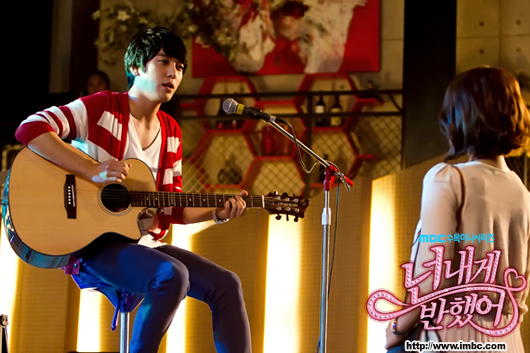 I love Shinhye as the Guitar Girl..I hope they can duet! thanks PSHIFC for sharing the news so fast! Ahhh... OMG! So many things going on in this episode. oh well, if they aren't...then, they should! hahaha.. they are so happy and funny together. seeing them together makes me smile. Shin Hye and Yong Hwa are both talented, hardworking and so humble but at the same time bubbly (SH) and naughty (YH). GOSH I LOVE THIS COUPLE A LOT! Yong hwa smiles happily coz shin hye makes him comfortable.. that's all about love.. feeling comfortable in every way... and they have been known each other since YAB, so "lucky" the song was the best words to describe their relationship as a friend, best friends and lovers awwww... love both of you!! i wish both of you have found each other as an endless first love til death a part. I LOVE PARK SHIN HYE and JUNG YONG HWA sooo much!!! yipieeeee!!!!! ahaha i wish hung yong hwa and park shin hye would be a couple one day!!!! i don't like jung yong hwa and seohyun. T_T i will cut seohyun's hair and kill herrr joke!! GO YONG HWA AND SHIN HYE!!!!! Yeah I don't want the tandem of Yong Hwa And SeoHyun.